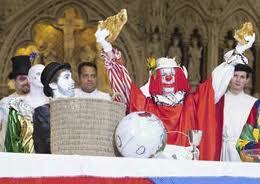 Clergy Gone Wild: Clowning Around With Communion. Content warning: Sarcastic blog post. Cynicism intended in love. 1. Bear-suit-vestmentscharist: What’s more inviting than a guy in a bear suit? 4. Avatarcharist: It’s just like the “DancesWithWolvescharist” only in 3d. 6. StarTrekcharist: Word on the street is that Shatner is a postulant for Holy Orders in L.A.
7. Paintballcharist: Anyone who doesn’t genuflect gets double-tapped. 8. Transformerscharist: Save the planet and uphold a transubstantiationist doctrine at the same time. 9. Nudecharist: Warning, only works with the right celebrant. 10. FindingNemocharist: After all, fish and loaves are biblical imagery. 12. Ninjacharist: Don’t mock it, Ninjas will take you out. 13. Ryan Seacristcharist: Just because it sounds funny and, hey, we’re Americans, we can always find a new Idol to worship. 14. MockGodcharist: Haven’t we already? I really do know that this isn’t anyone’s motive. But we sure look like weirdos here. I am part of a church with an average age of about 22, not a fuddy-duddy. But even I have to wonder why we have trouble realizing that the Holy Eucharist is, as Prayer A says, “a memorial of our redemption,” and treat it with a little respect. Anglican Christians know the power of the Eucharist. We know it is the best tool in our toolbox. Our recent oddball Eucharists bring an old aphorism to mind: “to a person with nothing in their toolbox but a hammer, everything looks like a nail.” We know the Eucharist “works,” but is it the only tool in our box? And, if the Eucharist is the “answer” to what ails the Episcopal Church, is it the answer to every question – like the old preacher’s joke about the Sunday School teacher who describes in detail a squirrel and asks the students if they know what the answer is and the kid says, “It sure sounds like a squirrel, but I guess the answer’s supposed to be Jesus.” Can we at least agree that the answer is not to out-weird each other at the altar? How are these odd-sauce Eucharists any different from the shameless attention seeking that we see and critique in the evangelical world…like for example the local church that put an Octogon on their platform and challenged people to “Get in the cage and fight for Jesus”? When we do these “creative” celebrations of the Lord’s Supper we appear self-referential, theologically squirrelly and missionally clueless. Do we actually believe that if we just dress up the bread, wine and our clergy with enough silliness the world will beat a path to our door? I have heard it said that these are “great for kids.” Help me understand this, what happens when the kids find out their priest isn’t really a clown? Or (wait for it) that they actually are? Wouldn’t it be far more helpful if, instead of inviting people to outlandish communion celebrations, we returned to the ancient church practice of going to the world; loving and serving people and speaking of our motivation rooted in the hope we have in the resurrected Christ? Or we could just sit around the office typing up more kooky Eucharists for liturgical junkies. Anyone for a Djangocharist? It would be high-action, and justice oriented – very attractional. We’d pack ’em in! Everybody’s looking for a gimmick. No gimmicks needed. It leads to a long road of gimmickry. That people want that sort of thing is just a sign of being lost and not wanting something truly different…other worldly different. These things are so bizarre I don’t exactly know what to think of it. A fb friend thinks its the natural result of giving up real presence and communing the un- baptized. I tend to think it is a well-intended desperation built on top of squirrelly theology and a failure of missional imagination. My daughter the liturgist on pirate baptism. Pretty funny. I couldn’t help but comment on your blog. Garrr! My kids are the most brutal liturgy critics out there, especially my daughter. And they have no use for stunts or goofy sermon illos. I’ve come to the conclusion that stunt eucharists are more about clerical boredom than anything else. And I think the message there ought to be, “you need to get re-engaged with what you’re doing in church,” rather than “it’s time to do something to prod the congregation.” I’m sure they need prodding from time to time, but throwing dignity out the window is usually not the road to success on that part. Clerics need to keep in mind that their congregation, for the most part, wants them to take church seriously. Good points each one. You obviously have sharp kids. I can’t tell you how disturbed I felt about this one…the picture alone! Too often the church forgets to be the church and who we are and what we are all about becomes blurry. The picture is pretty shocking. I am told they are actually proud of that event and the photos. I cant decide if the whole hung feels like an episode of the Twilight Zone or The Simpsons. I think your FB friend may be onto something. Ie, if the eucharist is viewed as a memorial, there are many ways in which to approach it, not the least of which might be some type of celebration leaning approach. Some Catholics view the eucharist as a sacrifice… I don’t quite get the logic of this, although it supposedly has some connection to Mary being co-redemtrix. If indeed it is a sacrifice, it would not seem unreasonable for some type of cultural attributes / pagan practices to be comingled a bit. If indeed the real presence is true, then an air of reverence should be displayed… In this regard, the rigidity of process and near engineering specifications as to the details as described by the church fathers would seemingly be appropriate… Ie, I sort of doubt that reverence should change as a function of time and/or culture. I am likely biased as I lean high church. The people doing it are Episcopalians, so we can assume: 1) some view of presence higher than memorialism. 2) some cultural ideas of respect. The people either have a magical view (the tailgate eucharist) or seen to have a desperation of “we know this is our go to tool.” Look up “pdqcharist” 2 minute Eucharist. That guy is an acquaintance.